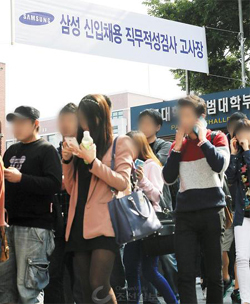 Applicants leave a high school in Seoul after taking a job aptitude test by Samsung Group on Oct. 13, 2013. Samsung Group recently adopted a new policy of giving top priority to job applicants recommended by the presidents of their universities and allocated a quota to each university. Job applicants recommended by their university president can skip the resume screening phase and are given a chance to take a standardized exam. This comes after Korea's largest conglomerate recently announced that it would reinstate resume screening in its recruitment process. It previously allowed anyone to take the standardized exam to select the highest scorers, but this has caused a frenzy as hundreds of thousands young jobseekers apply, spawning an entire publishing industry for primers and even dedicated crammers. Samsung says it informed around 200 universities on Friday how many students they would get to recommend each year. Sungkyunkwan University was allocated 115 recommendations, the biggest number, followed by Seoul National University and Hanyang University (110 each), and Yonsei University, Korea University and Kyungpook National University (100 each). Korea Advanced Institute of Science and Technology (KAIST), Pohang University of Science and Technology (POSTECH) and Sogang University did not reveal what quota they were given. The quotas have raised criticism that the conglomerate insists on its own yardstick for ranking universities. Samsung is part of the foundation at Sungkyunkwan University, which was allocated the highest quota, while universities like Hanyang, Inha and Ajou, which have strong science and technology programs, were also given a high quota. Women's universities were allocated way fewer numbers. Ewha, the country's most prestigious women's university, received 30, Sookmyung 20 and others 15 or fewer. A Samsung spokesman said the quotas were decided based on the ratio of alma maters of current staff, and it tried to balance this out by allocating 35 percent for regional universities outside the Seoul metropolitan area and another five percent for students from low-income families. But with criticism growing more vociferous, Samsung staff voiced dismay, claiming that critics were "overreacting." Noh Sung-man at Samsung said many people mistook the recommendations for guaranteed jobs, but in fact only around 5,000 applicants a year would apply based on recommendations from university presidents. And they would then compete fairly in the standardized exam and interviews against tens of thousands of other applicants who passed the resume screening phase. Samsung says the new recommendation policy is nothing more than part of its efforts to tamp down the application frenzy to join one of the nation's most coveted employers.